The first thing anyone asks me when they hear I can spell Blockchain properly is “Which coin should I buy?” or “Should I invest in this ICO?”. When I tell them I myself prudently ignore my own investment advice, I suppose I come across as some kind of selfish genius who doesn’t want to share his “secrets of success”. I am not a cryptocurrency speculator or an investor. I am a technologist. It is extremely sad that a technology enabler as powerful as Blockchain is just reduced to a few graphs that just reflects our greed, fear and ignorance. Cryptocurrency-to-USD exchange rate is an unintended side-effect of the market. People who want to own Cryptocurrency could either “mine” it or get it as a fee or purchase it from some place or some one. Cryptocurrency Exchanges are just one such source. Sadly, almost all the buzz about Cryptocurrency is about what’s its worth in fiat currency. And given that most cryptocurrencies have fluctuated several percentage points in a day, no one is using them as currency at all. If you can’t buy goods or services with it, it ceases to be a true currency. Some like to think, very wrongly, of cryptocurrency as a store of value. So sadly, what was designed to be a fiendishly clever, decentralized and resilient digital equivalent of currency is now limited to a speculative financial instrument. Stocks come to mind when one thinks of speculative instruments. And indeed, many think of the crypto-exchanges and ICOs and other related investments are very much like the stock market. They are partially right in the sense that one can bet on a certain cryptocurrency or invest in an ICO just like you would trade shares or invest in an IPO. Both stock markets and crypto markets are driven by fear and greed. However, a good majority of investors in the latter has an added disadvantage at this point: ignorance. A serious trader who deals with stocks has much greater access to material with which she can make an informed bet. An astute trader who knows the company, the industry and the market has a much better probability at winning the bets (an oversimplification, of course, with apologies to N. N. Taleb). Moreover, there are checks and balances. It is much harder for someone to run away with all the IPO money. Sure an Enron or a sub-prime crisis kind of situation occurs once in a decade or so. But the stock market is a picture of predictability compared to what’s happening in the cryptocurrency world. Toinvest in the cryptocurrency market at this point, you got to have a really deep understanding of what’s happening under the hood. Right now, there is not just an impossible amount of technology to learn but also insane amount of factionalism & politics that run deep in the cryptocurrency community. Of course, right from the introduction of Bitcoin, cryptocurrencies always had an anti-establishmentarian stand to take. But currently, the amount of factionalism is getting very hard to keep up with. Every fork (e.g., BTC vs BCC vs BTG, ETH vs ETC) is rooted in a deep schism within the community; every new way to integrate better with “traditional” markets and banks (e.g., Ripple XRP, Lightning Network) has its fair share of problems and conspiracy theories that need to be understood. There is so much happening under the surface that even experts’ hindsights after an incident (like a price crash) don’t always concur. Of course, there is a profit chasing motive for everyone in the crypto community. That doesn’t surprise me at all — what surprises me more is that many people think everyone in the crypto-community has altruistic goals. Sorry, folks — everyone wants to make a quick buck, same as you. What’s worse is that the media buzz covers very little of this underlying stories. The buzz is unavoidable but not very informative; in fact it can misinform. Most of the coverage is about polarized views by seasoned investors, who are still thinking within the framework of their “traditional” business. A common dismissal is that cryptocurrencies have no intrinsic value. Well, of course it is easy to prove they don’t an intrinsic value. The original aim of cryptocurrency was to create an alternative market where they are recognized as tender. Today, the “market-cap” for cryptocurrencies is being solely determined by the amount of trade in the crypto-exchanges (against the USD), not in terms how much goods and services are being bought and sold. It makes no sense to say that Blah-Coin has a market cap of $X trillion when one can’t even buy a pair of shoelaces with Blah-Coin. 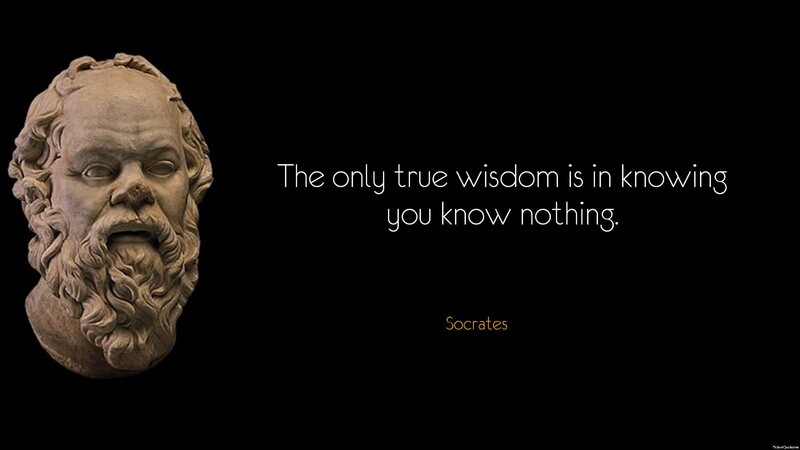 The Socratic Paradox is probably the best way to keep yourself grounded. People, especially the lay investors, are giving in to the media buzz and FOMO. Investing in the cryptocurrency world without understanding the technology, the motivations and the political climate is just a recipe for disaster. People are investing without realizing that they have to deal with an unimaginable amount of information asymmetry. They have only themselves to blame. Greed and ignorance rarely lead to a happy ending. My advice: Stay humble, stay curious but don’t accept over-simplified views of how the cryptocurrency world works. It is OK not to know. But remember that a simple explanation may be neither complete nor accurate. So don’t settle for a single narrative. In all this noise, we have forgotten that Cryptocurrency is not the only application for Blockchain. Right from the arrival of Bitcoin, the underlying distributed ledger called the Blockchain has piqued the interests of several smart people around the world. With the rise of Smart Contracts, especially with the arrival of Ethereum in 2015, Blockchain has come out of the shadow of Bitcoin. However, this is not without its issues. For starters, Bitcoin had several encounters with the darknet that caught the attention of governments and law enforcement agencies for all the wrong reasons. Governments and large financial corporations have always been wary about cyptocurrencies and as a side-effect, the Blockchain also got a bad name. For me, Blockchain is far more important as a technology than cryptocurrency itself. However, in the current noise and chaos, many seem to have forgotten that Cryptocurrency is only one application of Blockchain. With Ethereum, Smart Contracts were easy to write and for a while it looked very easy to build a Decentralized App (ÐApp). There were over 200 ICOs in 2017 (more than 4 per week) alone, raising over $3.7 Billion worth of investments. In fact, famously, around halfway into 2017, ICO funding trumped traditional VC funding. However, this was also not without its problems. Soon, there were utterly rubbish ICOs for tokens that made absolutely no sense. Writing ICO whitepapers was suddenly a mini-business. Then were reports of ICO scams, more scams, and Ponzi schemes. On top of that, there were too many phishing attacks, wallet thefts and other security issues that left a very bad taste in the mouth. The Blockchain technology seems to have transported back to its stone-age (post “The DAO”) days. Suddenly, investors that threw money without doing any due diligence, seemed to scream for government regulations. It would have been a hilarious situation but sadly it was true. The upshot of all this was that Blockchain was suddenly the same old shady darknet technology used by only criminals and fools. Authorities worldwide woke up from their slumber and decided to slap whatever restrictions they could. Thankfully, recent government news from South Korea and India give me some comfort that the authorities are not against Blockchain as a technology, whatever their views on cryptocurrency as a legal tender may be. However, that may not be enough. Smart Contracts are not new at all. Allowing an autonomous piece of software execute as per certain rules has no challenges as such but when it comes to do that in a peer-to-peer environment where there is no central authority, we need some kind trust mechanism baked in. Cryptocurrencies provide that trust. A cryptocurrency reward is a perfect incentive for all parties to remain honest. So writing a ÐApp without a crypto reward mechanism remains a challenge. Without this, there is a high chance that solution degenerates into a pseudo-centralized solution which is no better that the existing solutions. Blockchain technologies are still in their nascent stages. Much like the early days of automobiles — they are definitely not perfect but at the same time this is not their final form. These technologies will evolve and even if they never reach their Utopian ideal state, they will still make things a lot better. Every new, disruptive piece of technology through these phases. Remember the Internet and the WWW in the early days? The criticism was very, very similar. Some very smart people dismissed the Internet and they had ample logical reasons. It is worth noting that Internet today is nothing like what it was in the 1990s. It has evolved to a very different beast — not the same thing that was criticized back in the early days. It is not very different for Blockchain technologies either. We should be remain skeptical of any tall claims but still keep an open mind and rely on critical thinking to make informed decisions. My hope is that 2018 is the year where the ICO mania dies out completely (no major ICOs so far, that’s a good start to the year) and there will some good use-cases and ÐApps that will make the news. I also hope that the mainstream media loses interest in Blockchain and cryptocurrencies and the half-baked, poorly-researched clickbait articles will trickle down to nothing.